I remember when I had first heard of Red Umbrella. Recommended to me by a friend who had recently seen the Canadian band in concert as well as picked up their debut record, I looked into them and I liked what I heard. With that said, I had high hopes for their follow up, Living and Surviving, but was, and still am, quite surprised by the results. 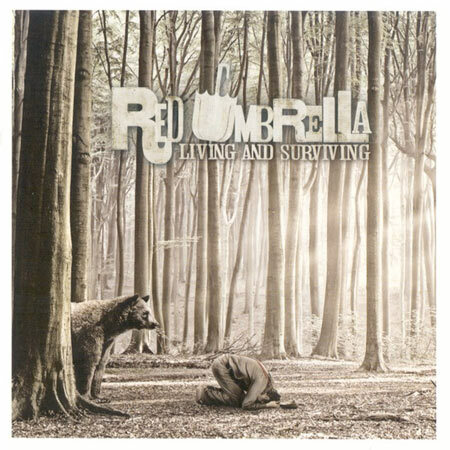 To start with, Red Umbrella has changed their sound significantly since Wishing For Boardwalk. Gone are the pure alternative rock melodies, and instead we get a synth-laden pop/rock sophomore offering. While they pull off the new sound well, there is an element to their old style that is somewhat missed. While it's definitely a fair statement to say that Red Umbrella has been trying to be progressive with their sound, this is almost so much of a change that it's a little hard to take it all in. This is similar to Family Force 5's genre change between their first and second record: Business Up Front, Party In the Back majored in the crunk rock realm, while Dance or Die left that sound behind and opted for a more electronic dance record. While I like both sounds, there is such a difference between the styles that it's almost a surreal feeling, and it's hard to get used to the new sound while still missing the old one. The same principle applies here. This isn't to say that this is an entirely different band than we first heard on Wishing For Boardwalk. We are still treated to the unmistakable trademark vocals of Jeremy Michaelis as well as the quirky lyrics we have come to know and love from the Canadians. Some standouts on Living and Surviving include "Prison Side," a curious tale of a criminal, "Beckoning," with an undeniable beat, and "Crazy (All Of Me)," which is odd lyrically, but in a good, mysterious way. One very apparent flaw is found in the track "Boompop." While the message of the song is admirable, there's a sudden rap from labelmate Playdough that rears its head in the middle of the song, and while it may have been an attempt to be different, it just sounds grossly out of place. Also, the appearance of the cover song "Turn! Turn! Turn!" (originally by the Byrds) is a tad disappointing. While it's done well enough and it's not a bad track by any means, it serves as the eighth of only ten tracks on the record. With only nine of the tracks here being originals, it's a little inadequate on the song quantity front. It's only a 32-minute long disc, too, so Living And Surviving is done and over a little too quickly. An addition of even one more track would have helped fix these problems. Red Umbrella deserves some props. They attempted to do something different with their music and be as unique as possible, and that's admirable. Hopefully, Red Umbrella will develop more on this sound (as opposed to changing genres again) and make it something amazing, but for now, they've put together an eccentric album that's worth a listen for old and new fans of the band.